Hopkins Theatre-in-English Workshop: Henri Bergson:"An essay on the meaning of the comic"
Henri Bergson:"An essay on the meaning of the comic"
At first glance it might appear that comedy is easier than drama; yet an exploration of the nature of good comedy must necessarily lead us to a contrary conclusion. 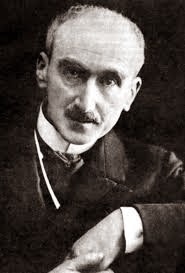 Comedy has its rules; for example the French writer Henri Bergson believed an important ingredient of humor is an involuntary act; likewise the mechanical aspects of life. The following extract is from Bergson's "An essay on the meaning of the comic:"
"A man, running along the street, stumbles and falls; the passers-by burst out laughing. They would not laugh at him, I imagine, could they suppose that the whim had suddenly seized him to sit down on the ground. They laugh because his sitting down is involuntary. "Consequently, it is not his sudden change of attitude that raises a laugh, but rather the involuntary element in this change,--his clumsiness, in fact. Perhaps there was a stone on the road. He should have altered his pace or avoided the obstacle. Instead of that, through lack of elasticity, through absentmindedness and a kind of physical obstinacy, AS A RESULT, IN FACT, OF RIGIDITY OR OF MOMENTUM, the muscles continued to perform the same movement when the circumstances of the case called for something else. That is the reason of the man’s fall, and also of the people’s laughter. "Now, take the case of a person who attends to the petty occupations of his everyday life with mathematical precision. The objects around him, however, have all been tampered with by a mischievous wag, the result being that when he dips his pen into the inkstand he draws it out all covered with mud, when he fancies he is sitting down on a solid chair he finds himself sprawling on the floor, in a word his actions are all topsy-turvy or mere beating the air, while in every case the effect is invariably one of momentum. Habit has given the impulse: what was wanted was to check the movement or deflect it. He did nothing of the sort, but continued like a machine in the same straight line. "The victim, then, of a practical joke is in a position similar to that of a runner who falls,--he is comic for the same reason. The laughable element in both cases consists of a certain MECHANICAL INELASTICITY, just where one would expect to find the wide-awake adaptability and the living pliableness of a human being. The only difference in the two cases is that the former happened of itself, whilst the latter was obtained artificially. In the first instance, the passer-by does nothing but look on, but in the second the mischievous wag intervenes. "All the same, in both cases the result has been brought about by an external circumstance. The comic is therefore accidental: it remains, so to speak, in superficial contact with the person. How is it to penetrate within? The necessary conditions will be fulfilled when mechanical rigidity no longer requires for its manifestation a stumbling-block which either the hazard of circumstance or human knavery has set in its way, but extracts by natural processes, from its own store, an inexhaustible series of opportunities for externally revealing its presence. Suppose, then, we imagine a mind always thinking of what it has just done and never of what it is doing, like a song which lags behind its accompaniment. "Let us try to picture to ourselves a certain inborn lack of elasticity of both senses and intelligence, which brings it to pass that we continue to see what is no longer visible, to hear what is no longer audible, to say what is no longer to the point: in short, to adapt ourselves to a past and therefore imaginary situation, when we ought to be shaping our conduct in accordance with the reality which is present. This time the comic will take up its abode in the person himself; it is the person who will supply it with everything--matter and form, cause and opportunity. Is it then surprising that the absent-minded individual--for this is the character we have just been describing-- has usually fired the imagination of comic authors? "When La Bruyere came across this particular type, he realised, on analysing it, that he had got hold of a recipe for the wholesale manufacture of comic effects. As a matter of fact he overdid it, and gave us far too lengthy and detailed a description of Menalque, coming back to his subject, dwelling and expatiating on it beyond all bounds. The very facility of the subject fascinated him. Absentmindedness, indeed, is not perhaps the actual fountain-head of the comic, but surely it is contiguous to a certain stream of facts and fancies which flows straight from the fountain-head. It is situated, so to say, on one of the great natural watersheds of laughter."